With Christmas right around the corner, today I’m sharing my favorite blessing that means so much to our family, especially my son. In December 2008, five months after Lydia died, another amazing gift was found. In the car, where we spent a lot of time, was where Lydia would compose her masterpieces, beautiful original one of a kind pieces of art. Randomly one rainy day in December, I put my hand in the back pocket of the seat, the one in front of where she used to sit. Pulling out multiple hair accessories, ponytail holders, and nail polish caught me off guard, choking me up with a flood of tears. Next, out came a neat white envelope and on the outside, carefully written, “To Hunter, From Lydia.” Without hesitation, I gingerly opened up the top and peered inside. My hands trembling with anticipation, I pulled out an incredible gift at just the right moment..
Christmas was just days away and I had found the perfect present for our son. Something to bring warmth to his tattered and torn heart, something that would provide him with the hope and love he so desperately needed. It was a drawing of a Christmas tree, complete with ornaments and a star! Today, this picture sits in a frame next to his bed. Another priceless gift that will last a lifetime. God is amazing! How beautiful!! What an amazing gift! Thanks Kate! We always got to keep our eyes open for those hidden treasures we may find at any moment! Tears… How beautiful. I think things like this pop up when we need them most. My mom died at 55 y.o.June 2008 and I missed her hugs so much. Several months later when finally going through her things, I came upon I card meant for a daughter ( me) but wasn’t filled out . The front spoke of loving cherished memories together and when I opened it , it said ” consider yourself hugged” . It felt like God knew I needed that! Oh what a beautiful gift. So sorry to hear about your mother. However, what a wonderful blessing given to you at just the right moment. It’s those little things that keep us going. God is so good! A lovely gift to treasure along with all the special memories. Been there, know what it feels like. So special ….. Thanks so much. I’m glad you are able to know the value of these amazing gifts..
What a precious story and gift. 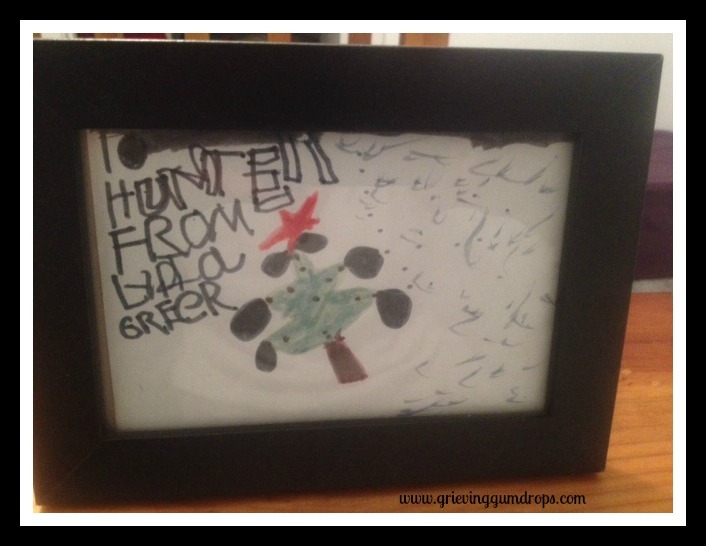 I’m glad Hunter keeps the beautiful picture Lydia drew for him in a frame at his bedside. A perfect remembrance that his sister loved and thought of him.